Cooking oils can become rancid when exposed to heat, light, and oxygen. As a result, oil processing that uses these methods affects the nutritional content, storage life, and quality of oils. Choosing a high quality cooking oil can be a challenge unless one understands the terms that food manufacturers use to describe the methods by which cooking oils are processed. When purchasing cooking oil, be sure to review the label and note the method of extraction, and whether the oil is refined or unrefined. Whenever possible, choose expeller-pressed, unrefined oils (see definitions below). 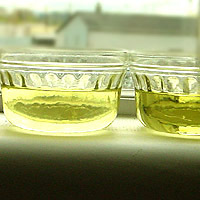 Select oils in light-resistant plastic containers or dark brown or green glass containers. During mechanical extraction, an expeller press crushes the seeds, nuts, or vegetables to extract the oil. This pressing is done under intense pressure, and raises the temperature of the oil to 185 to 200°F (85 to 93.3°C). Typically, nuts and seeds are heated up to 250°F (120°C) before being placed in the expeller; heating makes the pressing more efficient. Some manufacturers produce “cold-pressed” oils—a term typically used to describe oil that was extracted without using additional external heat. This term is also used when cold water is run through the expeller, keeping the temperature of the oil from rising. However, there is no legal or binding definition of “cold-pressed,” so oils may be so labeled even when temperatures were quite high during pressing. Solvent extraction is a more efficient and complete method of oil extraction, and is therefore the preferred method of large cooking oil manufacturers. During solvent extraction, nuts and seeds are cracked to expose the oil, and then combined with a chemical solution containing a solvent (typically hexane). The solvent pulls the oil from the nut or seed. The oil-solvent mixture is then heated to about 300°F (150°C) to evaporate out the solvent. Once the oil is extracted (either through mechanical or solvent extraction), manufacturers may simply filter the oil to remove some impurities and sell it as unrefined. Unrefined oil retains its full natural flavor, aroma, and color, and many naturally occurring nutrients. To extend the shelf life of the extracted oil, some manufacturers refine oils. Refining can include as many as 40 different steps, including bleaching, deodorizing, and degumming. Refined oils are clear, odorless, and less flavorful than unrefined oils, and are more suitable for high-temperature cooking. When purchasing olive oil, choose oil that is labeled “extra-virgin” or “virgin.” Virgin olive oils are produced from the first pressing of the olives, and are unrefined. As a result, these oils are more flavorful and more healthful.